Strawberry shortcake ice cream from Wonky Wonderful made with fresh strawberries and Twinkies. There is so much right with that statement I don't know where to start, except to say I now have to go to the store to get some Twinkies because I MUST make this ASAP. Check out this tri-fecta of sweet happines with Moore or Less Cooking's Groovy Caramel Bars. Look at this fantastic idea for a motorcycle enthusiast's birthday from The Mandatory Mooch. So cool! Cheesecake and brownies and cookies, Oh My! 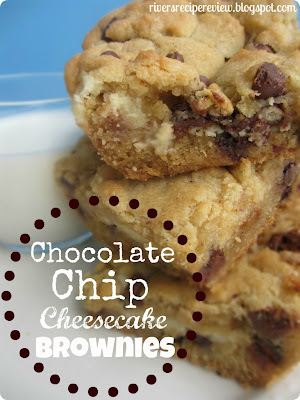 Yep, all in one wonderful place at The Recipe Critic with these chocolate chip cheesecake brownies. How can you go wrong with this combo?? Sweet! Thanks for the feature! You ROCK! So glad I found you, I've linked up and added you to my party list. Have a great week! Thank you! I have also added you to my party list. Those look absolutely sinful! Thanks for sharing! Thank you so much for featuring my Groovy caramel Bars! I am thrilled that you like them! My husband is a bolognese conossuer and he thought your recipe looked great, we will defineately be trying it! Thanks for hosting and linking up last week at my Pin Party. I have so many yummy foods to look at over here. Thanks for joining! I liked up at your site, you have wonderful posts! thanks for hosting. I linked up my millionaire squares. Thank you for joining, feel free to invite your friends, the more the merrier! Hi Lindsay, thanks for hosting! Great features!! Thanks so much for adding to the party and stopping by!